Give your promotional budget extra padding with this cost-effective folder--24HR! Keep important implements within reach as you’re plotting your next step, tracking your progress or charting your action plan. Specialty debossing effect gives your logo a color-enhanced look to make it pop! Store handouts and reference materials in the interior gusseted document pocket and extra outside pocket. One pen loop, six business card holders, two flash drive holders, two mesh ID window and one gusseted media pocket keep your most important implements on-hand. Ultrahyde padfolio includes an 8-1/2" x 11" writing pad. Zippered closure keeps your materials safe and secure when you’re on-the-move. For the junior-sized version of this padfolio, see item #111112-J-24HRPedova Jr. Zippered Padfolio - 24 hr. Size: 13" x 10" x 1". 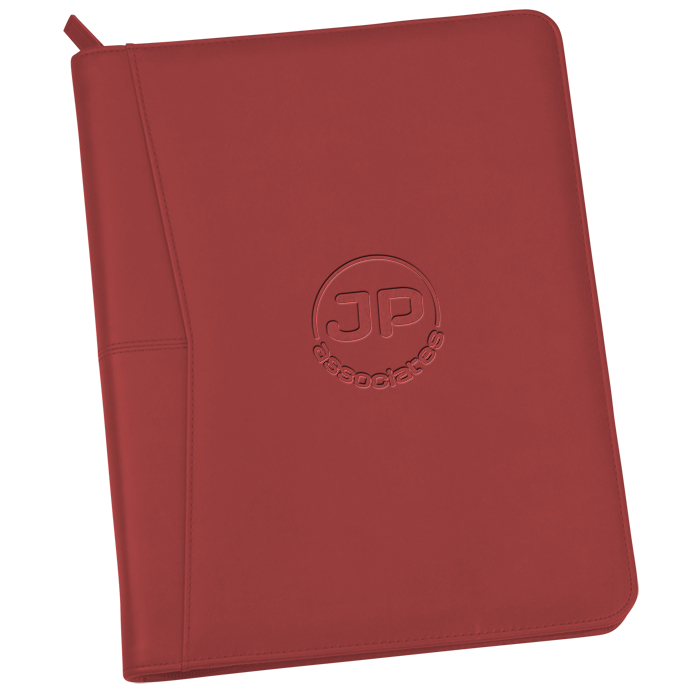 Your price includes a debossed imprint on the front of the padfolio.